One of the fun little subplots of the season of the season has been animosity between the Celtics and Hawks. The Celtics have taken the Hawks’ spot of two years ago as prime challenger in the East to the Cavaliers, and feisty point guards Isaiah Thomas and Dennis Schröder have gotten into it about whether or not Thomas talked trash about Schröder’s mother. Last night’s matchup, won 123-116 by the Hawks, brought one of the other tensions into play: Al Horford defecting in the offseason to the Celtics after nine years in Atlanta. 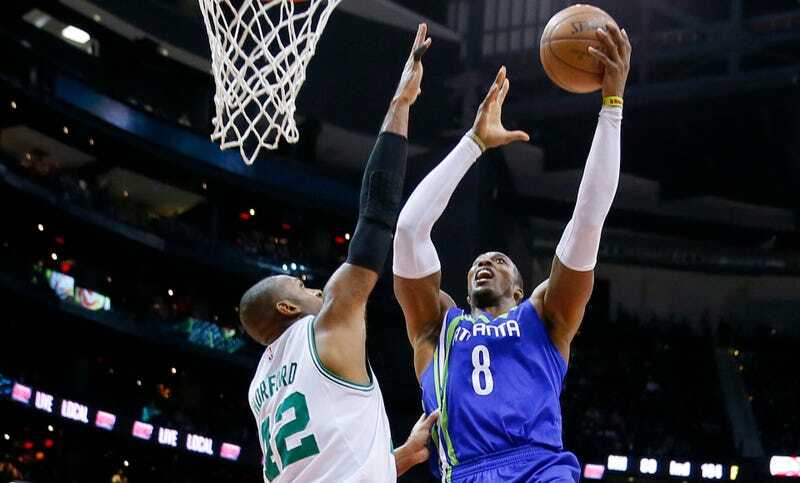 Horford was replaced—for one fewer year and $43 million less—by Dwight Howard. At this point Horford is probably the better player, but they’re also fundamentally different. Howard is still a somewhat fearsome low-post defender and rebounder, who cannot shoot from outside of six feet or make a free throw. Horford floats around the perimeter—he’s shooting 3.6 threes per game—and is a main facilitator of an Isaiah Thomas-based offense. But who cares about all that mumbo jumbo analysis?! In the third quarter last night Howard went directly at Horford on three straight possessions, and carved up the guy he replaced. That’s a right handed runner on the lane, a strong move with the left hand into the paint for a layup, and a nice bull-in-a-china-shop spin move to force a foul (he subsequently missed both free throws, naturally). Howard obviously isn’t an all-conquering terror anymore, and hasn’t been in quite a few years. He only had 10 points and eight rebounds, in 21 minutes, last night. But for a few possessions we were reminded of how good Howard was, and occasionally, still is.